In this paper, I intend to carry out a detailed study on Wild Strawberries (1957), a film that ­­­was written and directed by Bergman Ingmar. I will apply a Freudian psychoanalytic analysis to the film as a whole. Psychoanalysis is a set of ideas developed by an Austrian neurologist, Sigmund Freud and was later continued by others. The analysis was initially devoted to studying about the human psychological behavior and functioning, although it can be applied to societies. Psychoanalysis has the following main concepts: a method of an investigation of the mind and how one thinks; a systematic set of theories concerning human behavior; and a method of treating emotional or psychological illness. The study and practice of psychoanalysis led to the early popularity and acceptance of the linkage of dreams and cinema. Freud famously describes the interpretation of dreams as ‘the royal road to knowledge of the unconscious’ (1910 cited Thurschwell 2000, p.32). To explain his hysterical or neurotic patients’ symptoms, Freud would seek to reach for the material that repressively lay in their unconscious mind. As the patients freely associated to him, saying all that flowed into their mind as it happened to them, Freud discovered that dreams and their continuously baffling content was a regular topic. As he advanced his dream analysis theory, he ran after developing a methodology in which meaning would be taken from the apparent nonsense depicted in oneiric images and narratives. Freud concludes that the unconscious mind uses dreams as an act of fulfilling wishes, providing an environment of imagination where unfulfilled or repressed desires can be satisfied. He encouraged his patients to relate their dreams’ content as well as freely associated observations concerning the memories and events their dreams reminded them of. With the observations, Freud was seeking to work with his patient to get beyond the dream’s ‘manifest content’ in order to ascertain its ‘latent content’; that inner meaning which expresses the unconscious desire that is being expressed. The distortion separating these two forms of content giving the dreams their absurdity characteristic protects the dreamer from guilt and shame that the desire may provoke. 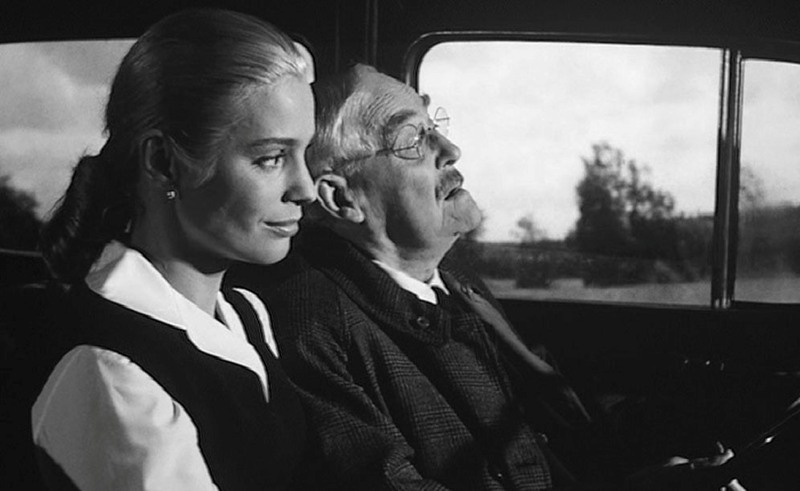 A good example of such dreams is depicted at the start of Bergman’s Wild Strawberries of 1957. In its pre-credit sequence, the film introduces us to Isak Borg, the isolated and ageing Professor who is supposed to travel the next day from Stockholm, his home, to receive an honorary degree at the University of Lund. During the eve of his journey and presentation, he gets disturbed by a very unpleasant strange dream (Bergman 1960 32). In the dream, Borg becomes uneasy when his regular walk, according to the dream, leads him into a part of the city that is not familiar to him. As the vision unfolds, his discomfort intensifies: his heart starts beating audibly when he discovers that his watch is handless, suggesting that he is lost: lost in time and space. When he approaches the only person in his sight, the figure happens to have worn a grotesque death-mask on his face but disappears on Borg’s touch. The stranger leaves just a small pile of clothing and some blood-like thinly flowing liquid. It is the sounding of a church bell that marks the arrival of a hearse that is driverless horse-drawn. The vehicle loses one of its wheels, and the coffin hurls onto the pavement just in front of Borg and it splits open. He reluctantly moves forward towards the coffin to check the body within. When he does so, the corpse reaches its hand out to grasp at him. Borg is even more horrified when he realizes that the figure inside the coffin is his own; the corpse then grabs Borg’s hand, pulling him closer to it until Borg’s face entirely fills the Corpses’ vision. At this point, Borg wakes up, and is very agitated by this vision. As a result of this nightmare, he quickly amends his plans for the day; he decides to drive to Lund rather than using his scheduled flight. This choice gives the way for encounters and a reflection comprising the rest of Borg’s remaining part of journey and film. While Borg stated that he is content with the self imposed splendid isolation state in the opening monologue, his assertion is belied by evocation of fear during the sequence of the dreams. His self discovery as an animated corpse within a shattered coffin clearly shows the old man has subconsciously realized that he is currently in a state of living death- a conclusion he reaches more categorically and consciously later in the film, after a seventeen-minute sequence that is more complex. The second dream takes place when Borg and his travel companion Marianne stop at his family’s childhood summerhouse. Borg, as he lay in the wild strawberry patch, dreams of events that happened about fifty years ago. In the third dream, in the second half of the film, he sleeps in the car’s passenger seat. This dream runs for a fifth of the entire film time where he returns to the earlier vision of the strawberry. The film ends at appoint where Borg is left alone in bed and drifts into yet another dream. He dreams about his parents; he moves from discomfort and anxiety of earlier dreams to contentment. This more overt depiction of wishes that are fulfilled indicates that Borg has already resolved the issue that earlier tormented him and is reconciled with his family, looking backwards and to future. In conclusion, it can be argued that Freud’s psychoanalysis influenced many writers. I have tried to apply a psychoanalytic analysis to Wild Strawberries film on a specific character: Isak Borg.